This is part three of a multi-part series reflecting back on the games developed during the first year of the Singapore-MIT GAMBIT Game Lab, a five-year research initiative created to address important challenges faced by the global digital game research community and industry. Last time, we looked at AudiOdyssey, a rhythm game designed to be playable by the sighted and the blind. Today we focus on Wiip, one of many games developed during the summer internship program. Wiip was one of six games developed at GAMBIT this past summer. As you might have guessed from its name, the game uses the Wii remote as its main controller. The Wiimote, as it is commonly called, was chosen as the controller to give players a greater sense of immersion and agency in the game. When playing Wiip, the player steps into the role of Mustachio, a circus ringmaster whose animals have gotten out of control. As the cute creatures run and bounce towards the screen, it is the player's job to stop the creatures before they attack. Fortunately for Mustachio, it only takes a simple crack of his bullwhip to tame the animals. Players can also utilize the whip crack, which triggers the combo system that has the potential to tame all the oncoming animals on the screen at once. But what does any of this have to do with research-oriented game design? Press play for a video walkthrough of the game. Alex Mitchell, Wiip's Product Owner, set out to explore the spectrum between abstraction and expression in game design, while creating a new vocabulary for interactivity in the process. This research goal was a driving force in the adoption of the Wiimote to play the game. The Wiimote makes use of multiple accelerometers to measure the movement and tilt of the controller. This technology allows the player to manipulate the Wimote like a real whip, creating a greater sense of immersion when playing the game. Although the game is meant to be played using the Wiimote, Wiip can also be played with a computer keyboard. "It was fascinating to see how testers responded to the controller. Those who were unfamiliar with the Wii remote played a bit timidly at first, whereas those who had used a bullwhip before could be seen gesticulating wildly in front of the computer screen. Eventually both groups tended toward a happy medium which allowed them optimal control with a minimum of exhaustion. "We also encountered an unexpected difference in the play style of female versus male players. When female testers played Wiip, their movements tended to be more graceful and fluid than their male counterparts. This resulted in few of their motions exceeding the game's force threshold, which detects when a player's movement is significant enough to be interpreted as a swing of the whip. This was a challenging aspect to tune, since the threshold needs to be sensitive enough to correctly detect a swing without generating false positives as the player adjusted the direction of the Wii remote to target specific lanes. A compromise was reached after extensive focus testing of female players. "Since we were targeting a broad audience, I tried to find as many testers as I could from the MIT community and beyond. Perhaps the best feedback I got was at a local ice cream parlor, where I was showing the game to some friends and observing their patterns of play. As they were playing, the employees of the store jumped over the counter and asked to play Wiip. They picked it up quickly, and seemed to greatly enjoy the game. In fact, one of them asked me, 'Did you just buy this next door?' I was confused until I recalled that the ice cream parlor was next to a game specialty retailer, and replied, 'No, we made this game.'" More games in the Wiip universe are currently in development at the Singapore branch of the GAMBIT Lab. Wiip was created by Alex Mitchell, Teo Chor Guan, Joshua Wong, Zhou Xuanming, Edmund Teo, Jonathan Johnson, Desmond Wong, Tio Lok Ling, Trey Reyher, contains original music by Guo Yuan, sound effects by "Fezz" Hoo Shu Yi, and voices by Matt Weise. 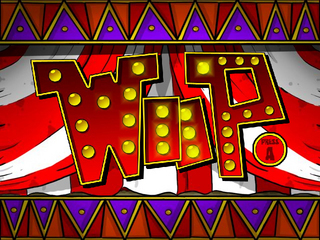 Wiip can be downloaded here.